"Just another day in hospitality" turned into something significant and influential when Debbie Rottier said yes to the call of the ministry. "This is what I want to do," she prayed. "I want to serve the saints, reach out to the lonely, and minister to those who bless our mission with their teachings." All of a sudden, the drudgery she had once felt was replaced with anticipation for each new day, fresh with inspiration, creativity, and a continuous flow of the gifting God had instilled in her. "Showing hospitality is not something we do; it is who we are and what we live. Debbie has done an amazing job helping new generation YWAMers understand the heart of God in living a lifestyle of hospitality. 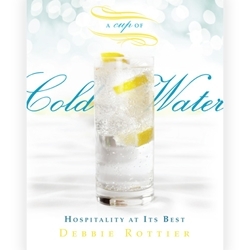 Her book is like a cup of cold water, refreshing every time!" "In 1 Timothy 3 and Titus 1, Paul includes hospitality as a requirement for spiritual leadership. Why is it so important? Because it expresses the heart of God to honor people and embrace what is new, foreign, or different. . . . I commend Debbie [Rottier] to you. Learn from her all you can about this important spiritual leadership gift-hospitality." "I wish every host or hostess could read and apply the advice given in this book. Battle-weary missionaries will thank you for your efforts." Debbie Rottier joined Youth With A Mission in 1982. She has managed ministry hospitality departments, run hospitality seminars, and provided oversight to hospitality teams for major events and conferences throughout YWAM. She has a special heart for missionary moms. Debbie, her husband, Arnold, and their three children serve together in YWAM.